In some specific applications, the measuring environment can have unsuitable characteristics for a correct electronic functioning; it is not possible to connect a sensitive element to the conditioning electronics by standard cables or by a radiofrequency link. A possible solution could be a contactless link with a passive sensor inside the measuring environment and a readout outside. This paper discusses the telemetric system consisting of two contactless coupled planar inductors. The two inductors form a coupled transformer in air, with the primary one connected to the measurement electronics and the secondary one working as the sensitive element. A polymer deposited on the secondary one is sensible to the humidity, and changes its dielectric permittivity causing a variation of the inductor parasitic capacitance. A conditioning electronics measures frequency resonances, while the system extracts the corresponding capacitance values, compensating the distance variation as well. The whole system has been tested in the laboratory, and several results have been reported. These show about 200 fF variation over 1.7 pF for a change of the RH between 60% and 90% at a constant temperature of 22 ◦C. Moreover, the measured data are compensated on distance variation changing from 15 mm up to 30 mm. The complete explanation of the whole measurement system is described here. The low cost of the sensors and conditioning electronics implies a high diffusion in many application fields, from food packages to automotive. A contactless sensor represents an attractive solution for high-temperature measurements in harsh environments, where the use of cables is not suitable, and where the temperature values are beyond those permitted by active electronic circuits. 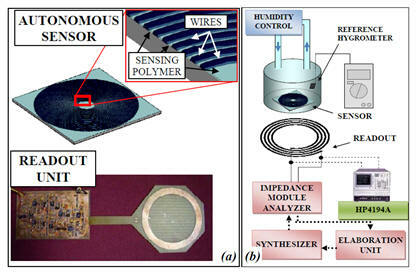 Temper­ature sensors have a wide variety of applications in automated processes for temperature control and regulation. 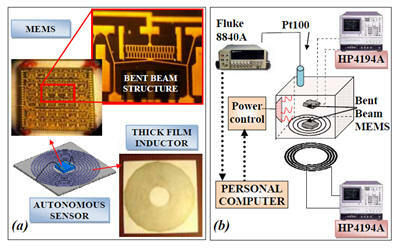 This paper describes a passive sensing device suitable for high-temperature measurements consisting of a microfabricated temperature-sensitive variable capacitor and a planar inductor designed for high-temperature environments. Another readout inductor con­stitutes, together with the planar inductor, a telemetric system, which is a coupled transformer with the readout connected to the measurement electronics. The proposed passive hybrid mi­croelectromechanical systems (MEMS) consists of an interdigi­tated capacitor bonded to the planar inductor. The hybrid sensor behaves as an LC resonant circuit in which the interdigitated capacitor represents the capacitance and the planar inductor is the inductance. The temperature induces a displacement of the conductive electrodes of the interdigitated capacitor toward the ﬁxed electrodes realizing a temperature-sensitive variable capac­itor. An equivalent circuit scheme of the variable capacitor and the planar inductor has been analyzed. Two telemetric measure­ment methods, relying on a frequency variation output, have been tested. The whole system has been tested in the laboratory, and several results are reported. Finally, the sensor prototype was fabricated and successfully characterized up to 330 ◦Casa proof of concept of temperature sensing through passive wireless communication. The proposed telemetric temperature system can be a solution for efﬁciency monitoring and predictive maintenance for harsh and complex environments, thereby eliminating the need for physical contacts, active elements, or power supplies, which cannot withstand harsh environments.